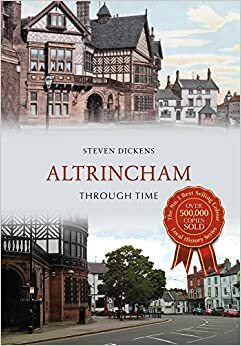 The market town of Altrincham, historically a part of Cheshire but now part of the metropolitan borough of Trafford, has a rich history. The name Altrincham is derived from the old English meaning the homestead of Aldhere’s people. The Roman road to Chester ran through Altrincham, but there is no evidence that the Romans ever settled in the market town. Altrincham’s market was created by charter in 1290 and in the medieval times a court leet was established, the town eventually becoming a borough in 1886, with an elected council. Hamon de Massey was given land in the area by William the Conqueror, the de Masseys remaining influential until the male line died out in the fifteenth century. From the de Masseys the estate passed to Robert del Boothe of Barton in Irwell and in 1627 the Earls of Stamford became Lords of the Manor, rebuilding Dunham Massey Hall, which they left in 1855, returning to Altrincham 1906. The estate was bequeathed to the National Trust in 1976. Altrincham Through Time will detail much of this history and its buildings, like the former town hall of 1900 and the former hospital on Market Street. Urban and industrial development now mean that Altrincham remains a diverse, but still desirable, residential and suburban environment.